AUSTIN, TX--(Marketwired - Dec 13, 2016) - Snow Software, the leading developer of Software Asset Management (SAM) solutions, today revealed that SAM and IT managers around the world are most afraid of being audited by Microsoft, Oracle and SAP. Asked to identify the top three vendors they feared being audited by, 75% of respondents highlighted Microsoft, followed by 53% for Oracle and 33% for SAP. The same survey found that in terms of audit activity, 68% of organizations had been engaged by Microsoft in the last 12 months and 36% by SAP. IBM took the third spot, auditing 31% of organizations in the past year. 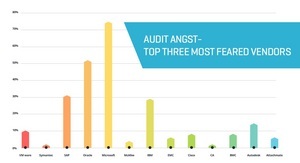 Matt Fisher, Vice President at Snow Software, commented on the findings: "While we expected to see Microsoft reported as having the highest volume of audit activity, it is surprising to see them take the number one slot in terms of being feared by their customers. In our experience, Microsoft is actually one of the least aggressive and difficult software auditors. We typically hear far more horror stories from customers that have been audited by Oracle or Attachmate (now Micro Focus). "Our advice is that, if you have your software assets under control, there's actually little to be afraid of during the audit process. A fear of audit suggests that organizations recognize a lack of control and up-to-date SAM intelligence." With many software vendors -- including SAP, IBM, VMware and Citrix -- deep into their fourth quarters and scrambling for low-hanging revenue opportunities, it is not surprising that audit angst is particularly high at this time of year. Fisher continues: "The year-end audit has long been a stalwart of Q4 revenue for many software vendors, whether performed as an outright audit or disguised as an incentive to upgrade to the latest versions and technologies. These situations can actually work to customers' advantage if they are holding the right information about their current software use and plans for the coming year." 1. Acknowledge the audit request as soon as possible - the worst thing to do is ignore the initial audit letter. The auditor will not go away. A prompt response within a few days of receiving the audit letter will make what follows easier. 2. Do your homework - discover as much as possible about the vendor conducting the audit. The best way to prepare for an audit is to know what's required well in advance. 3. Self-audit - Perform a full inventory to discover all assets including hardware configuration, software deployments and usage. 4. Be proactive - Compare the inventory against license entitlements and create effective license positions for all software vendors. Defending an audit can be easy if organizations have the right solutions in place. Deploying a Software Asset Management (SAM) solution helps ensure the software estate is optimized before responding to the audit request and avoid unbudgeted costs. For more information on the actions you can take to prepare for and defend an audit from Microsoft, SAP, IBM, VMware and others, download Snow's Santa Claus or Audit Clause: what does the festive season have in store for you? eBook here. Headquartered in Stockholm, Sweden, Snow Software is the largest dedicated developer of Software Asset Management solutions, designed to ensure that the $326 billion spent every year on enterprise software is money well spent -- ensuring organizations have the appropriate licenses for the software they use -- not too many, not too few.